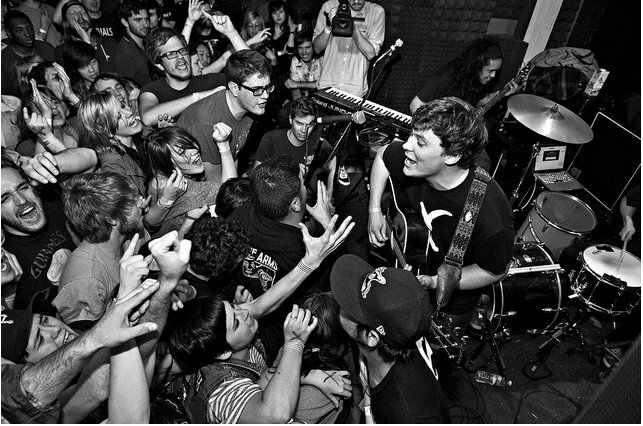 Despite being a the two-piece band, The Front Bottoms deliver an unprecedented blend of acoustic, indie and punk exemplified in their 2010 self-titled release. Duo Brian Sella and Matt Ulchich use subtle dance beats and simplistic acoustic riffs layered with some off-the-wall trumpets and keyboards, which creates a familiar-yet-unique indie rock sound. Sella's lyrics often reflect the trivial events in day to day life everyone can relate to in some way or another, but with added depth. The song "Bathtub" has a refrain of "I am washing my hair with soap," but holds an emotional self-revelation tucked within the simple lyrics. The whiny vocal delivery like in "The Beers" is never bothersome, and occasionally contrasted by an almost conversational spoken word delivery, such as in "Rhode Island." This unpredictability makes Ulchich's drum beats all the more enjoyable and dance-worthy. The Front Bottoms are a refreshing band; where many rock or indie outfits seem to be rehashing old ideas and simplifying song structures, The Front Bottoms have been able to turn the basics into brilliance. The music is catchy, fun, and sometimes even cathartic but it never gets old or seems clichéd, which can't be said for other indie and punk bands these days. Having toured with a variety of bands such as Mansions and The Menzingers, The Front Bottoms appeal to a wide audience with one of the most unique sounds you'll come across lately, so do yourself a favor and check them out on their Bandcamp here. You can thank me later. The Front Bottoms are touring late January through all of February with Bad Books and Weatherbox, so be sure to catch them when they stop in your town!